Nothing beats a classic dessert like cheesecake. However, most cheesecake aficionados would agree that no cheesecake is complete without its berry topping. When you top a cheesecake with such a fruity compote, it can turn a plain cheesecake into an extraordinary one. 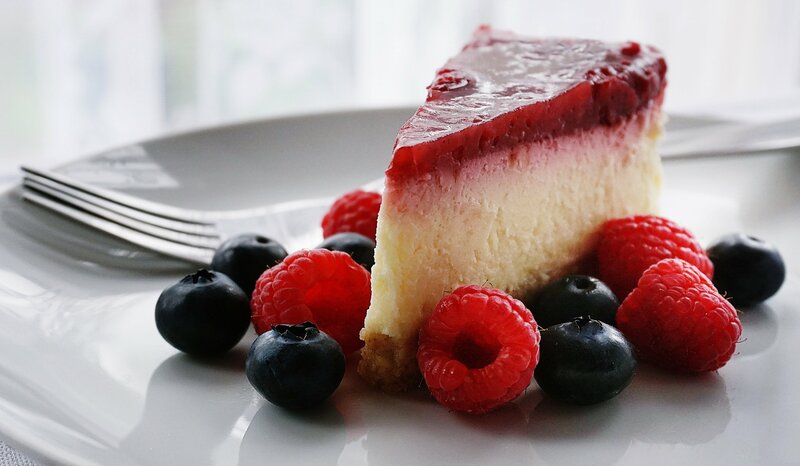 But very often, adding that special fruit-flavored topping over cheesecake can be inconsistent. Even worse, the topping eventually waters down the surface of that perfect filling you worked so hard for. But never fear! 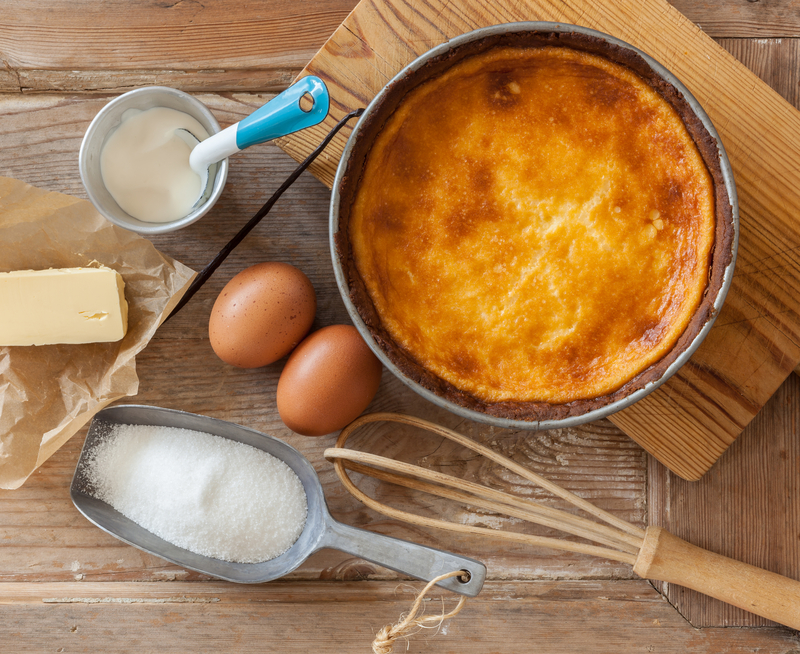 We have the secret to perfect cheesecake toppings every time and it is so simple to create. 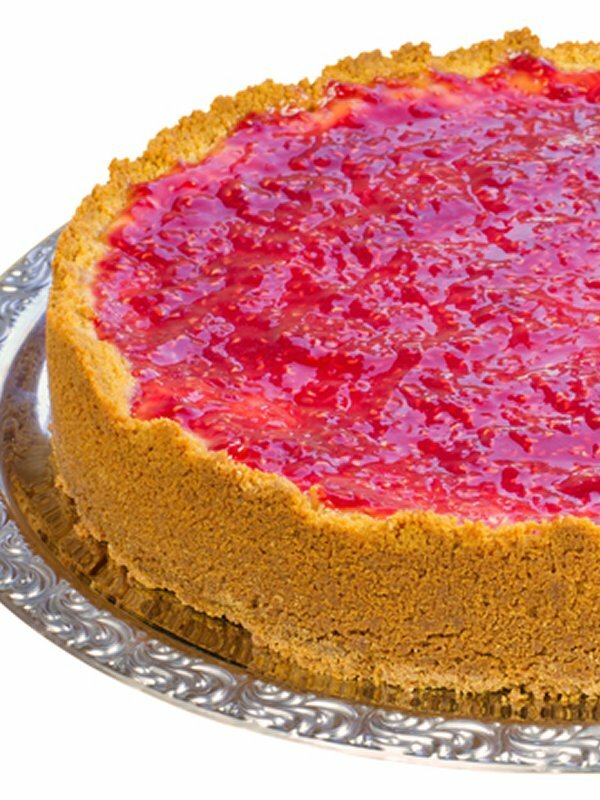 By adding agar agar powder, a mixed berry compote transforms into a delicious layer of fruity flavor that sits evenly atop any luscious cheesecake. Agar agar sets more firmly than gelatin and can withstand very high temperatures without melting. Agar agar is also free of all animal products, as well as gluten, wheat, corn, soy, and yeast. 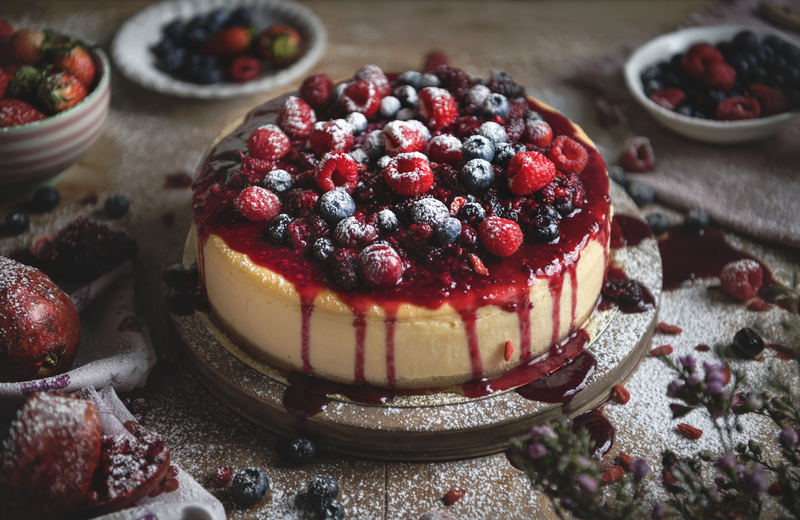 With a little agar agar powder the jelly layer of this mixed berry cheesecake sets beautifully, has that sweet/tart balance and a great gel-like consistency. Better yet, the filling is rich, not too dense and the crust offers that toasty, honey infused note that is signature of all cheesecakes. Here is our secret recipe . . . bon appétit. 1. While the cheesecake is baking, place the berries in a saucepan and bring to a boil. 2. Reduce to a simmer and let simmer on low for 8-10 minutes. 3. 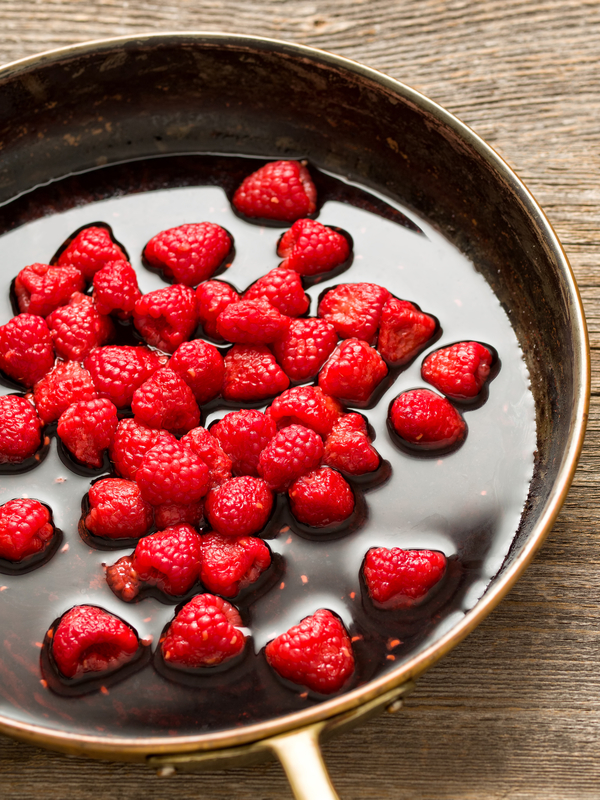 Pour into a strainer placed over a bowl and gently press the berries to extract their juices. Set aside the berry pulp. 4. Add the remaining ingredients for the topping and stir. 5. Return to the saucepan and bring to a boil. 6. Reduce to a simmer. Let simmer for 1 minute. 7. Add some of the berry pulp to the jelly then remove from the heat and let cool for 3 minutes. Do not let the topping set. 8. Pour the jelly topping over the cheesecake in an even layer. *See cheesecake recipe below. 9. Let the jelly set before transferring the cheesecake to the refrigerator to chill for at least 2 hours. 1. 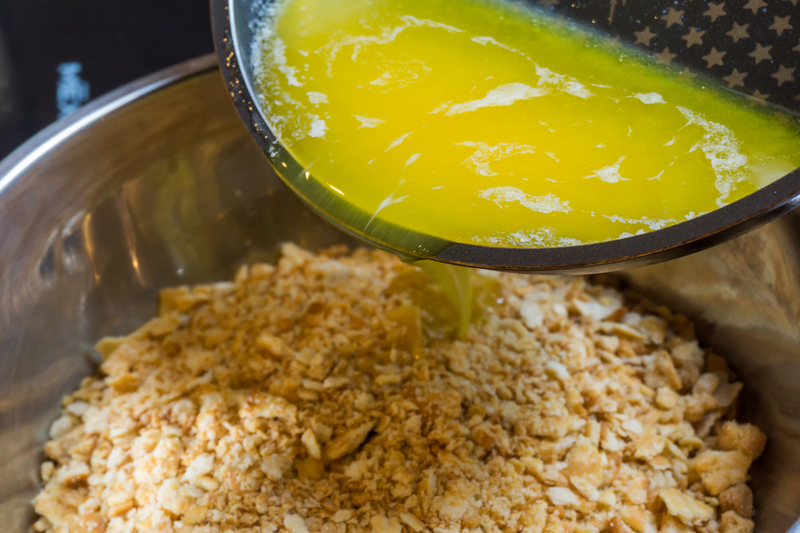 Stir all the crust ingredients together until well combined. 2. 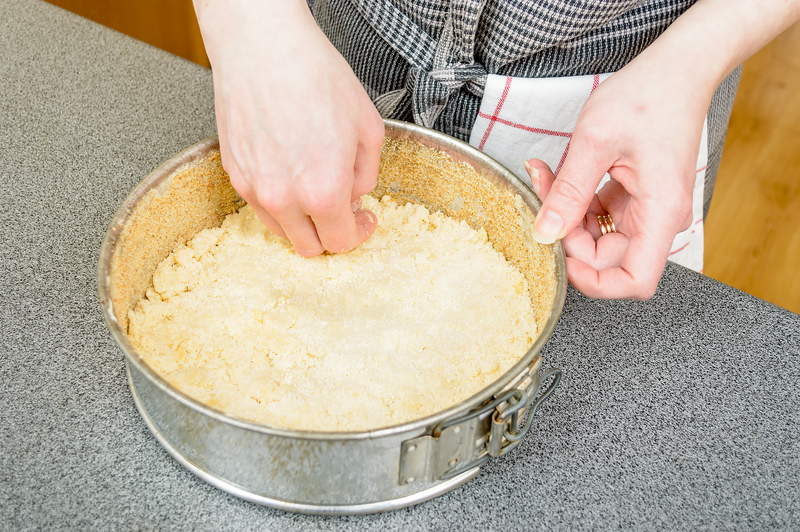 Press the mixture into the bottom and up the sides of a 9-inch springform pan. 3. Bake the crust for 8-10 minutes or until lightly golden. 4. Remove from the oven and set aside. 1. 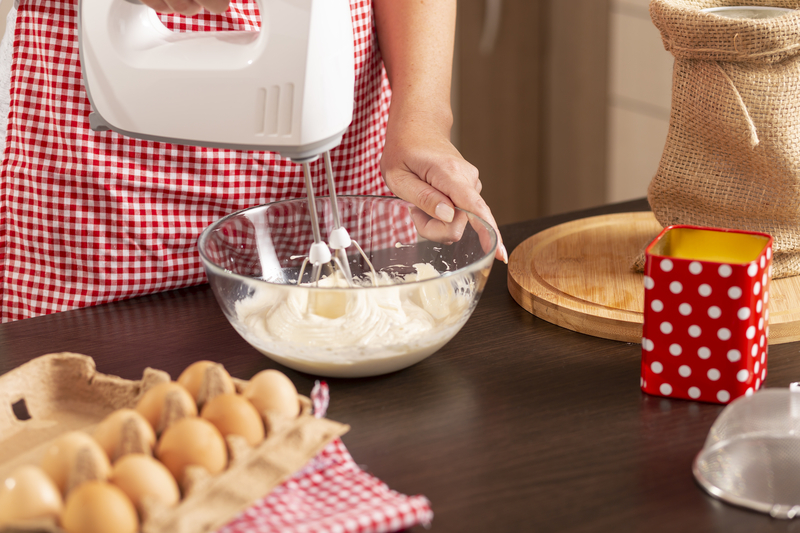 Use an electric mixer with a paddle attachment to beat the cream cheese on medium until smooth. 2. Add the sour cream to the beaten cream cheese along with the eggs, sugar and vanilla extract. 3. Mix on low until combined. Do not overmix. 4. Pour the filling into the crust and spread evenly. 5. Layer two sheets of foil and wrap the bottom of the springform pan with that foil. 6. Place into a larger pan. 7. Fill the larger pan with about 3/4 inch of water. The water should not pass the foil. 8 . Bake for one hour at 350 ° F or until the center is almost set. 9. Remove from the oven and set the cheesecake aside to cool for at least 45 minutes. 10. After the topping is poured and the cheesecake refrigerated for two hours, run a knife along the edges of the springform pan. 11. Carefully release the cheesecake from the pan. 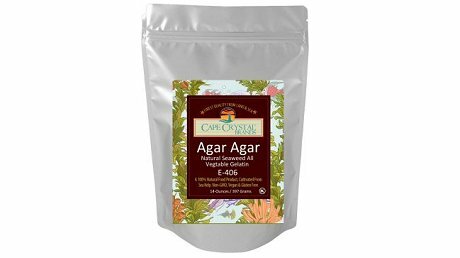 Cape Crystal Brands agar agar is not only a great choice to hold cheesecake topping together, it is particularly useful for baking, making vegan cheese, jellies, custard & marshmallows by substituting animal gelatin. 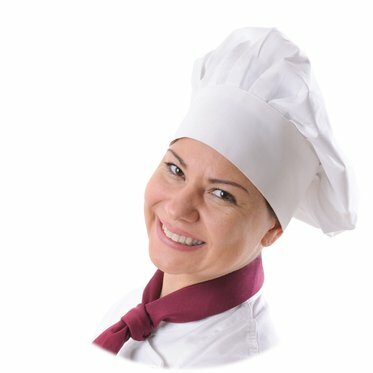 Cook delicious recipes without any artificial ingredients! HIGH IN FIBER, TOO: The Cape Crystal agar powder is over 80% fiber which can be miraculous for your intestinal health! With regular use you are bound to become “regular”! Suggested serving for mixed berries topping cheesecake. Tatiana is a writer and food enthusiast from Los Angeles, California.